Today, after a stormy night, I woke up and was finally forced by the lack of sun to use the generator to charge my laptop and satellite modem. After breakfast, Domi, Eva, Mauricio, and Badia came to visit. Mauricio patched up his climbing boots while the rest of us strategized about the summit window. Domi was able to spend a night in Camp III while everyone else had descended. 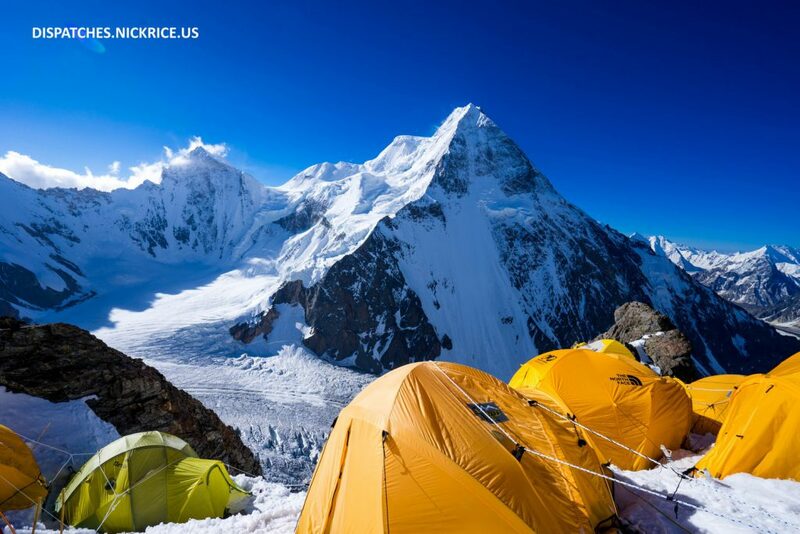 I feel that I must sleep a night in Camp III and descend before I will be ready for an ascent of K2 without oxygen. 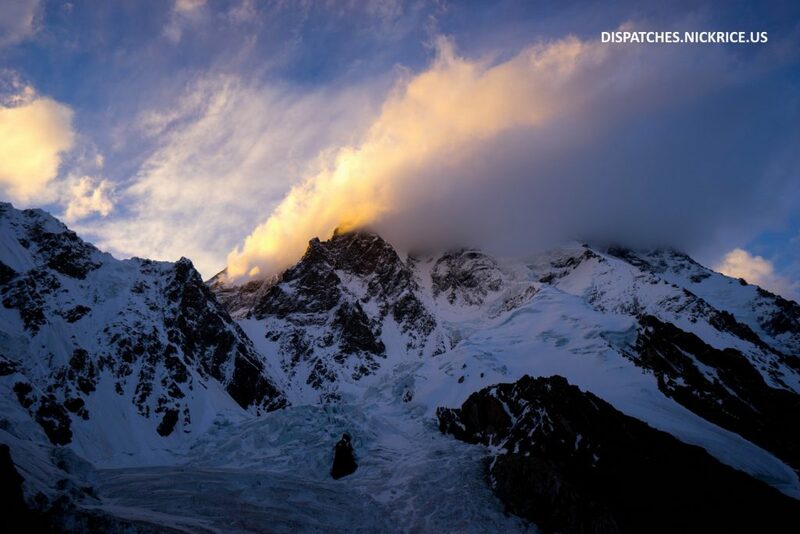 The timing will be tricky as heavy snow will make the final slopes to Camp III avalanche prone and difficult to pass. 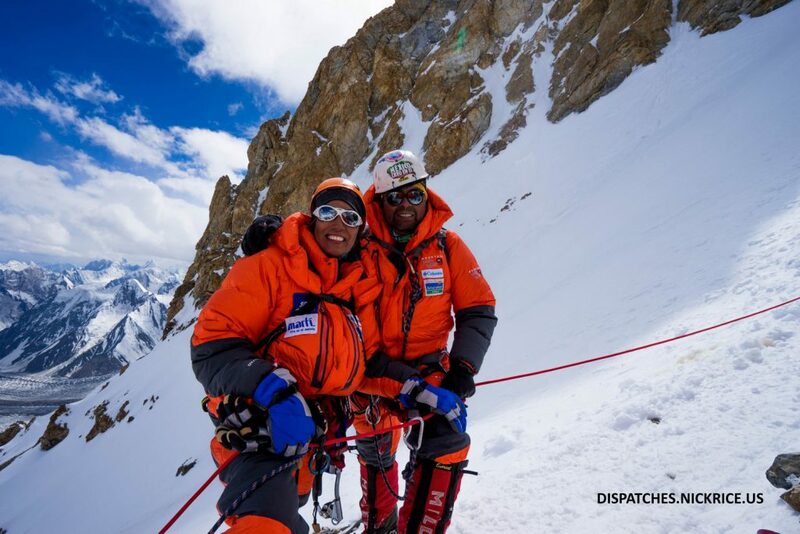 But we remain optimistic as we have till the 5th of August before we must begin the trek down and the normal summit window on K2 usually falls on the last few days of July. 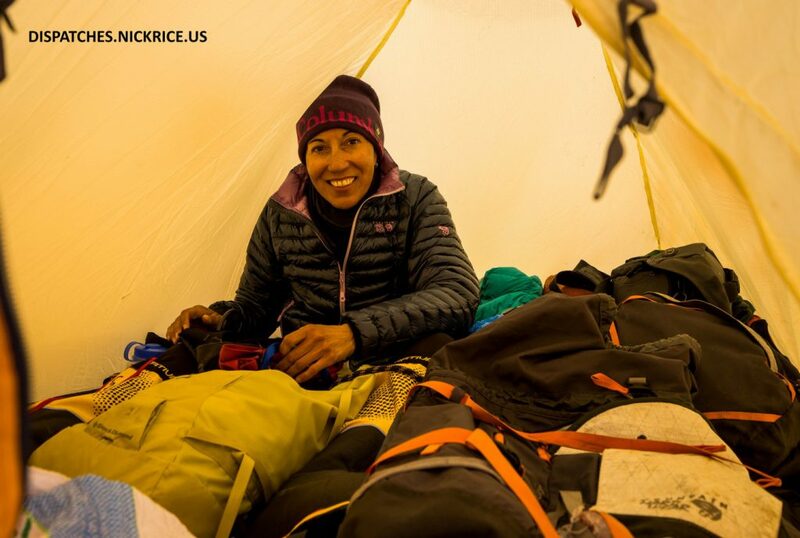 Today, I woke up early, had a delicious breakfast, and prepared my pack for the climb toward Camp III. The weather fluctuated between sunny and snowy, but showed signs of improving. By the evening, the winds were calm and there was no more snow. I plan on leaving Base Camp by 4:30am tomorrow morning. Today, I slept in till 9am, had a leisurely breakfast in a snowy base camp, and spent the morning working on secondary applications. 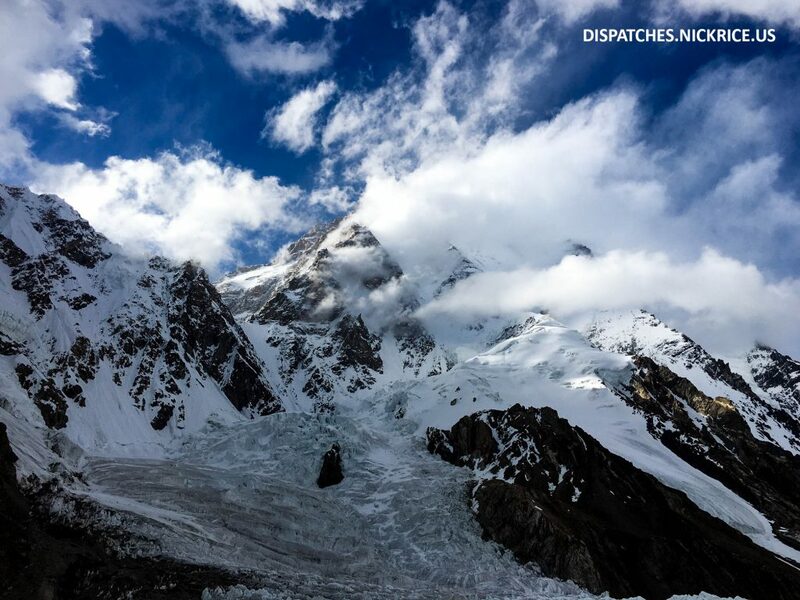 In the afternoon, those who intended to climb higher on K2 came down as winds blasted the mountain. Badia and Mauricio came down to my camp to make me a Mexican dinner, which they cooked in my kitchen tent under Akbar’s supervision. We enjoyed the evening together then went our separate ways as the cold forced us into our sleeping bags. Today, Badia and I woke up at 5am in Camp I, made water, packed up our equipment, and began descending at 7am. The morning was calm and clear and we arrived to ABC in just two hours. We made our way through the ice fall below ABC and arrived to Base Camp around 11am. We parted ways and I had a late breakfast in my mess tent with Akbar. Having not eaten much in Camp I prior to my descent, I had very little appetite. I also managed to miss my upper face when applying sunscreen so ended up with a severe sunburn. Despite this, I managed to rally the energy necessary to get through another three secondary applications for medical school. I showered before lunch, ate, then invited Badia, Mauricio, and Thomas over for dinner. I spent the rest of the afternoon working on applications. 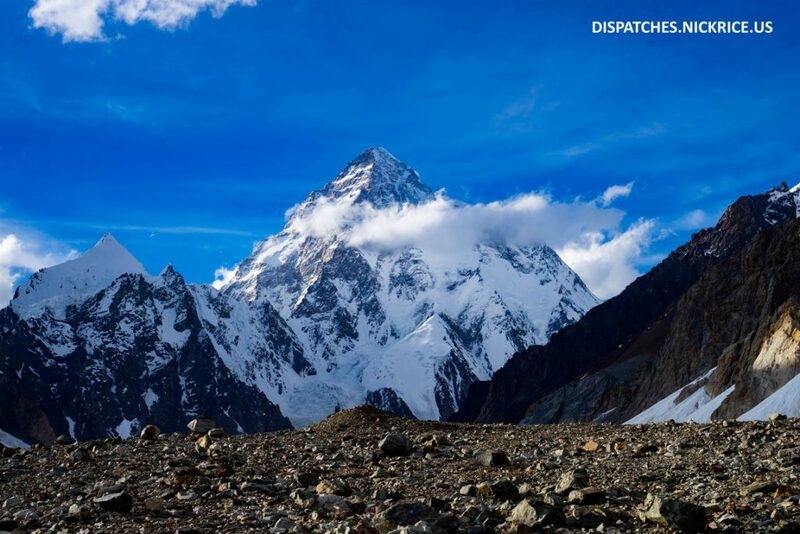 Manzoor, the owner of Karakoram Tour Pakistan, arrived to base camp around 4pm after ensuring that everything was perfect with his expedition in Gasherbrum Base Camp. The weather had deteriorated throughout the day, but became calm again after the sun set. As we finished dinner, we went outside to enjoy the beautiful moonless night. 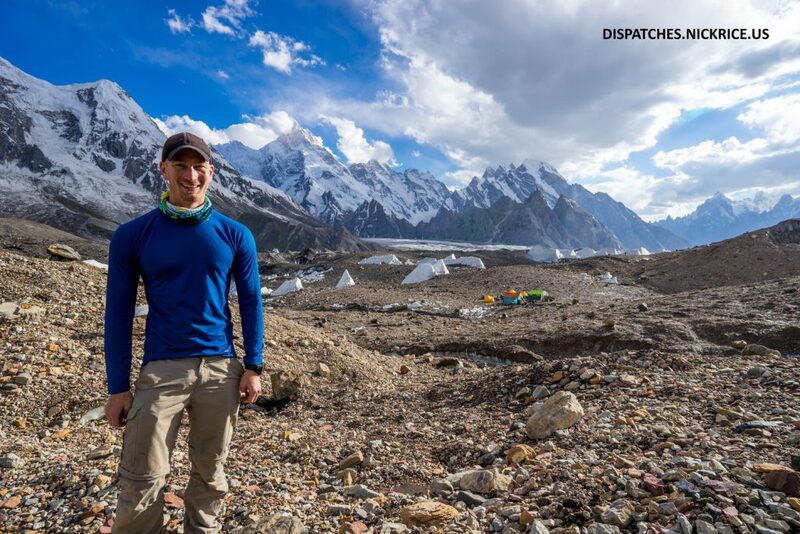 Today, I woke up to a calm, cold night at 3am, prepared my equipment, and had a quick breakfast in the heated mess tent (thanks Karakoram Tours Pakistan!!!!). I started up the glacier and after a half hour, met up with Badia and Little Hussain. We continued together up to ABC (17,400ft/5303m) where we stopped for a quick break to put on our harnesses, sunscreen, and crampons. The route up the glacier was in relatively poor condition, as I punched through to my knees a number of times despite it being only 6am (before the sun had had a chance to warm the glacier). 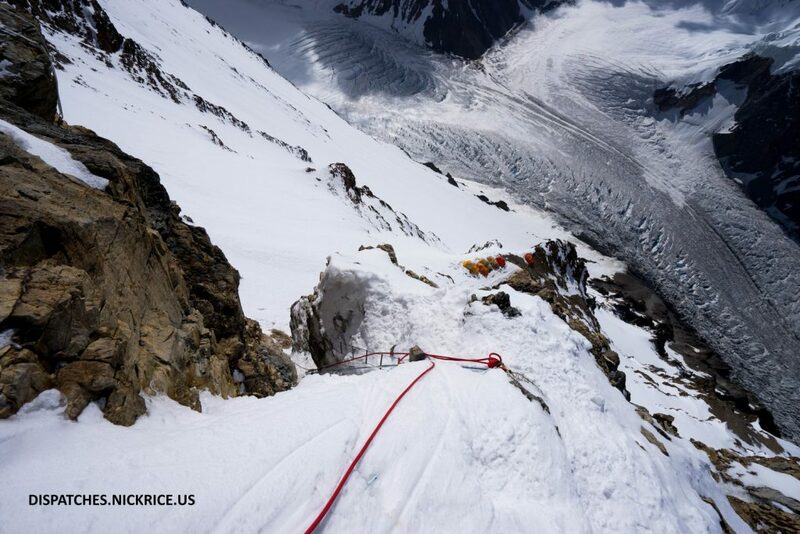 We continued up toward Camp I, the slope reaching 70 degrees and the route climbing over mixed ice and rock. We dodged a number of falling rocks, which bounced off of the slope at terminal velocity, changing direction each time. Little Hussain suggested that he rush ahead, as I was climbing quite slowly due to the heavy load I was carrying (25kg). When Badia and I finally arrived, Little Hussain had already set up a tent and claimed one of the few remaining flat places in Camp I. 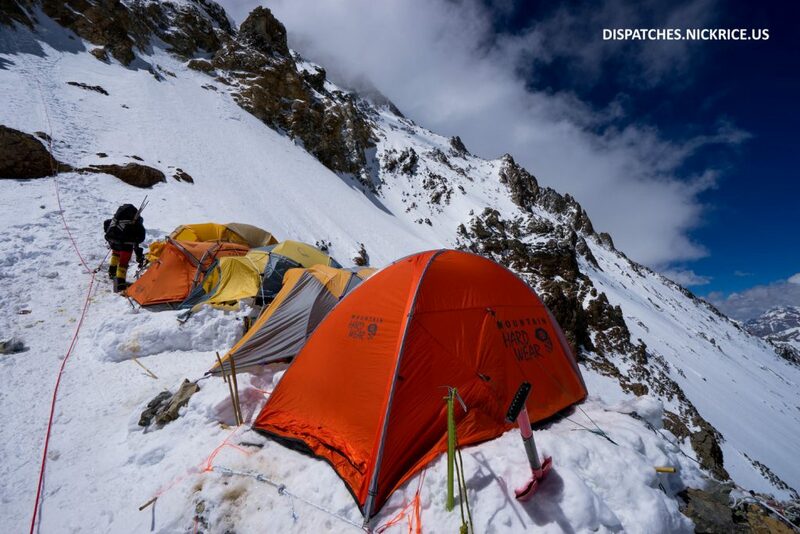 Many other climbers were not as lucky, having to sleep on inclines that made their night quite restless. Badia and I felt great after a nap in Camp I, had dinner as the sun set, enjoyed the beautiful views toward China and of Broad Peak, then went to sleep. 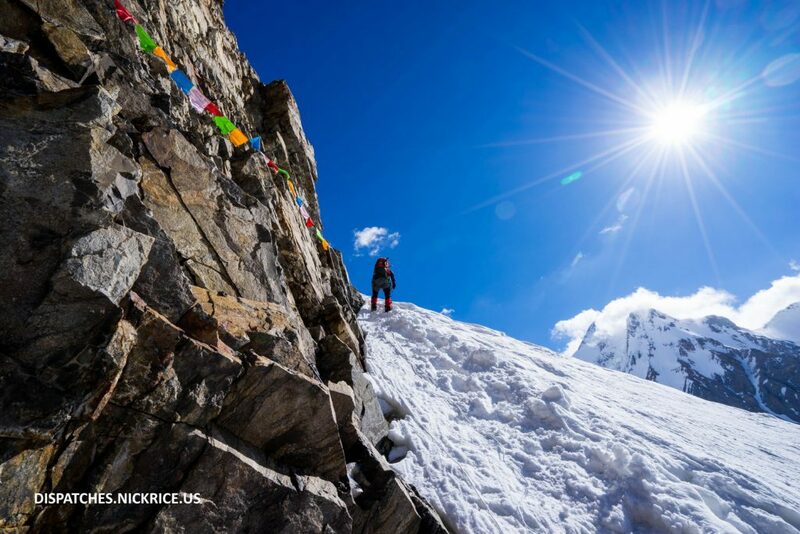 Tomorrow, we plan to descend to Base Camp where we will rest and allow our bodies to acclimatize (alter hemoglobin’s affinity for oxygen and make more red blood cells). Today, I woke up at 7:30am as the sun warmed my tent, had breakfast with Akbar, then headed up the glacier to visit with the Mexicans and Spanish. We eventually returned to my mess tent as it is much warmer and continued talking until lunch. In the afternoon, I continued sorting out my equipment and optimizing my solar array. I checked the weather and made tentative plans for my approach to the mountain. Badia and Mauricio visited once again in the late afternoon and we spent the time working, them on their dispatches, and me on my secondary applications for medical school. I had a delicious dinner with Akbar, then went to sleep early. Today, Akbar and I had an early breakfast, broke down the camp for the last time, and began the short trek to K2 base camp. 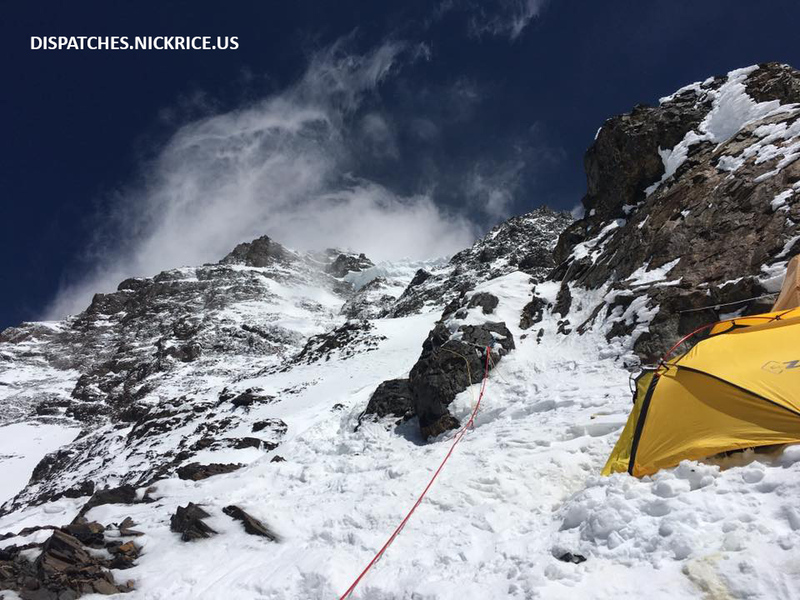 Fortunately, we had a few friends already in K2 base camp so we were able to place our base camp in the center (the higher camps are extremely cold and at risk of being hit by avalanches and the lower camps are far from the route, but warmer). 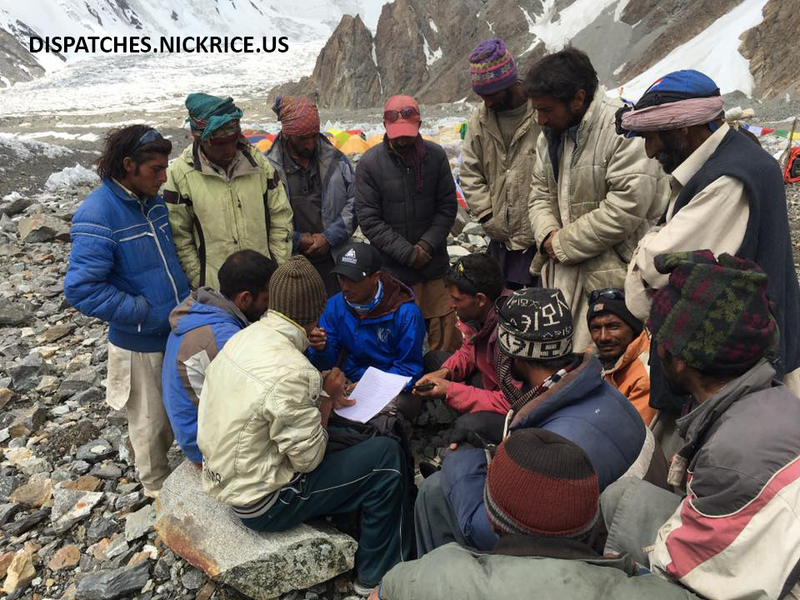 We spend upwards of two hours sorting out the payments for the porters. Once this was finished, I had to pay them their tips. I had Akbar translate, as I was breaking from the norm. 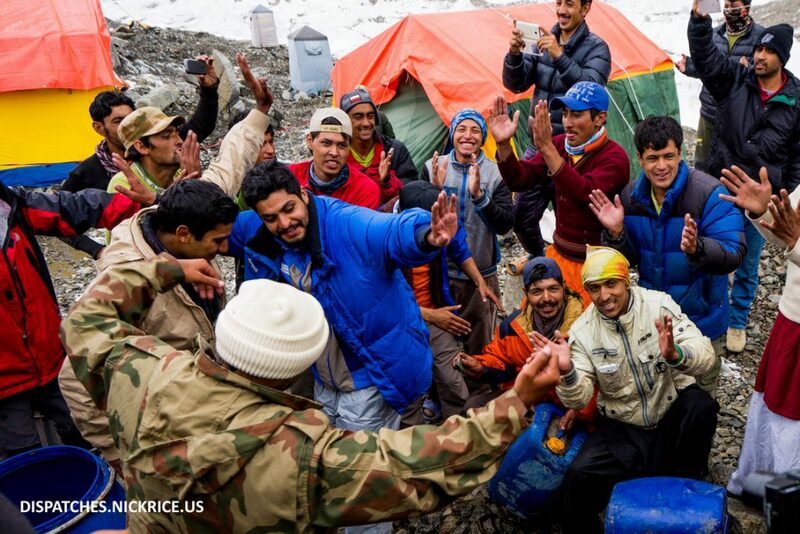 I explained that they had already been paid for the service of carrying the equipment to base camp. The tips are for those who go above and beyond what is expected of them by helping to establish the many camps along the way, helping Akbar in the kitchen, or arriving very quickly to camp without complaint. Unlike most expeditions, I didn’t tip based on the number of loads (this practice gives the people who load the horses up to 4x the tip of a traditional porter and on our trek, these men were the problematic ones). Instead, I tipped each individual based on his work on the trek. I gave a base tip to all so that no one felt left out, but made a point of acknowledging the hard work of the few who had outperformed the rest. They received tips up to 2000 RS ($20.00) higher than the rest. I thanked them all for their hard work and most began trekking down quickly to Urdukas (where it is much warmer). The few who had done the most work on the trek stayed after they had been paid to help Akbar and I set up our base camp. They were extremely gracious and a pleasure to work with. After the kitchen and mess tents had been put up, Akbar and I got to work setting up everything else that makes base camp livable. The first things I set up were my solar array, charge controller and batteries. Despite the bad weather in base camp, I was able to get more than 5 Amps off of my solar panels and charge my laptop and satellite modem. 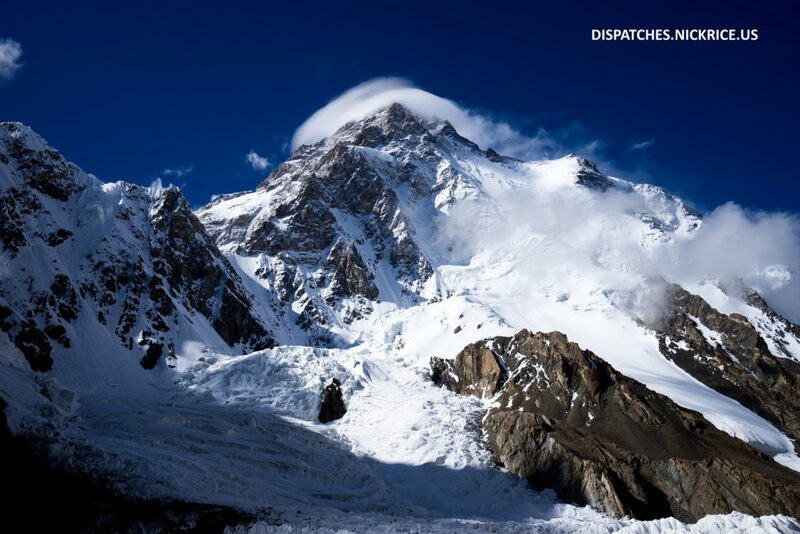 We received news that some of the Leila Peak expedition had not received their bags due to a mix up at Goro II that resulted in the bags being sent to Gasherbrum Base Camp instead. Additionally, all of their members were lacking the EPI gas that they had purchased from the agency (the pressurized gas canisters we use to cook in high camps). These had apparently been forgotten by the agency in Skardu. Fortunately, all of my things arrived safely to base camp. I plan on resting a day or two, depending on the weather, and then climbing either to Camp I or Camp II to sleep before descending. The camps on the Abruzzi Spur are already nearly at capacity due to the huge number of climbers on the mountain this season, so we will have to see whether placing a Camp I is even an option. We may end up just skipping this camp altogether and climbing directly from base camp to Camp II. The stars begin to shine above Mashabrum as the light fades into a moonless night. 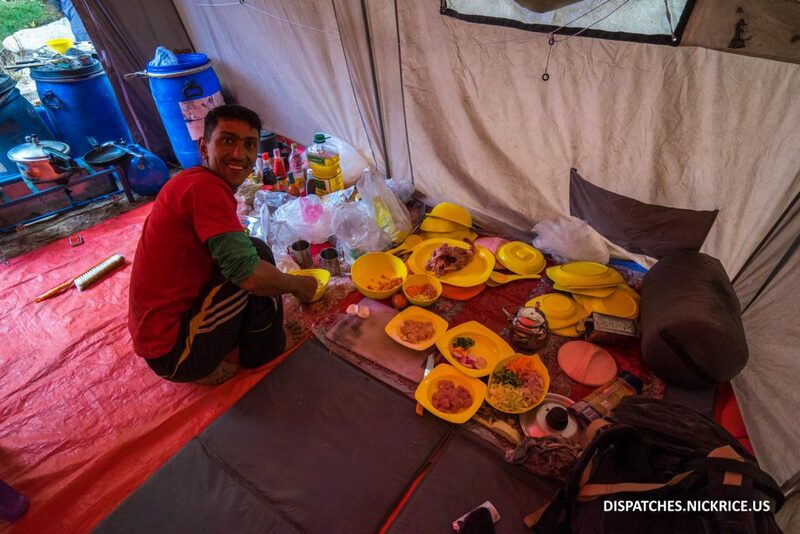 Today, after an extremely cold night, I struggled to wake up at 5:00am, packed up my equipment, and had a chilly breakfast in the kitchen tent with Akbar and our Sirdar, Yassid. I stayed up quite late last night to take pictures of the staggering number of stars that were visible in the moonless night after the Matam. The ceremony was truly enchanting. We sat in a circle on the glacier in the dark while Little Hussain sang about the death of Hazrat Ali and many in the circle wept aloud. The matam is a lament for his departed soul and commemorates his martyrdom and valor at Karbala. We completed the ceremony with the du’a and walked back to our camp. I really treasure these experiences. After everything was packed up, Akbar and I departed toward Concordia. The morning was cool and a breeze made the walk enjoyable. 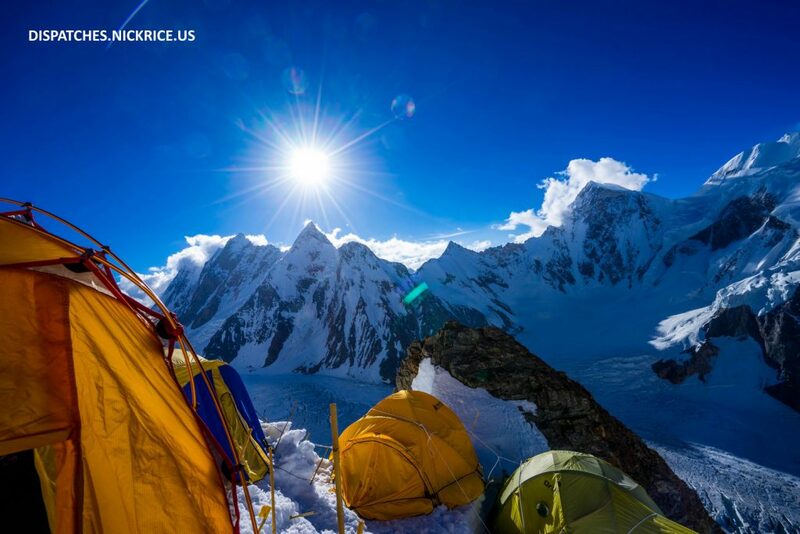 We arrived to Concordia where we took in the stunning views of Mitre Peak, Gasherbrum IV, Marble Peak, and Broad Peak. 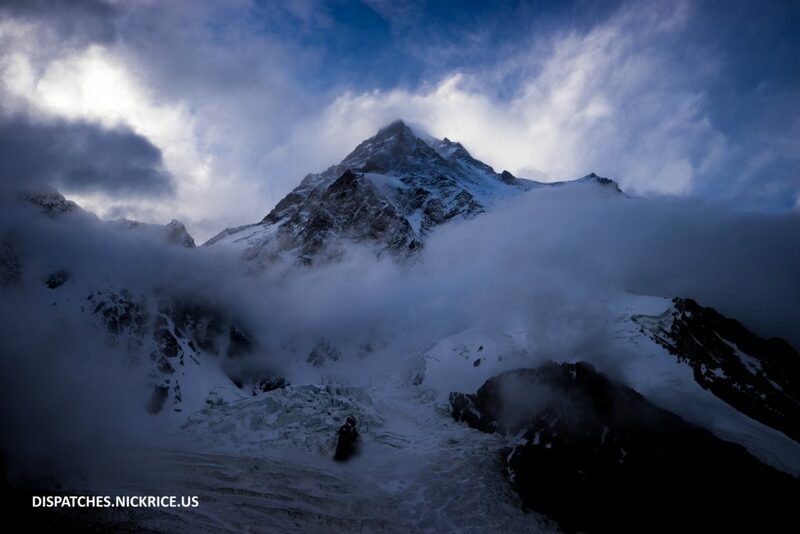 K2 was obscured in clouds, but soon we were blessed with a view of the summit. 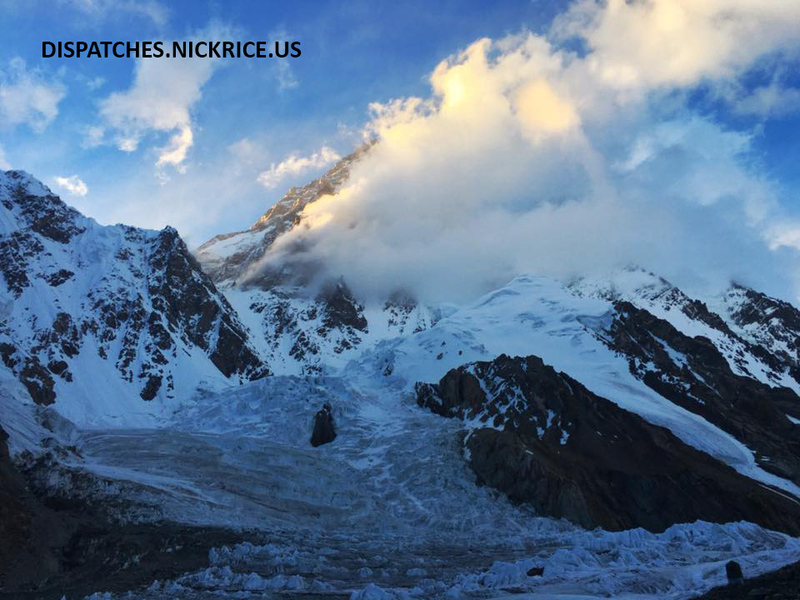 After more than 8 hours, we arrived to Broad Peak base camp at 15,717ft/4790m elevation. 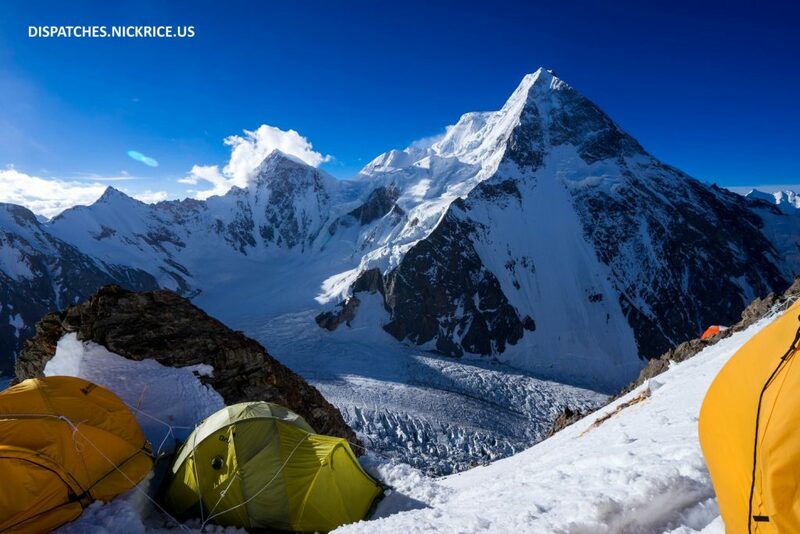 We set up our kitchen, then witnessed an enormous avalanche sweep the route below camp I on Broad Peak. We also were made aware that another of our horses had fallen into a glacial river and had been injured. The horse was sent down to lower elevation, and our things were salvaged, but this incident again drives home the point that this glacier is no place for these animals. The rest of the afternoon was spent relaxing and preparing for the departure of our porters tomorrow morning. 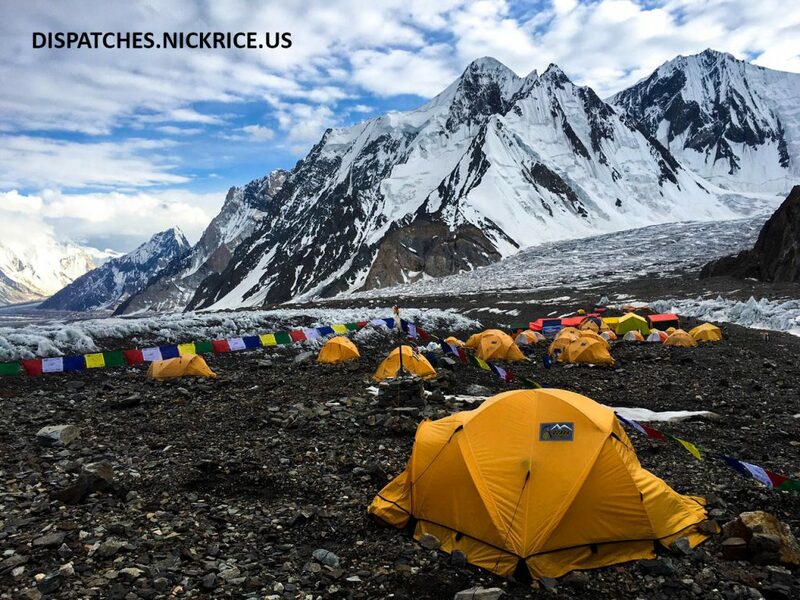 The trek from Broad Peak base camp to K2 base camp is only 45 minutes long so we will have the remainder of the day to set up our base camp. My trekking guides for the day. Today, I woke up at 5:00am, packed up my equipment and had a quick breakfast. Some of the locks on my barrels had gone missing yesterday and even though nothing inside seemed to be missing, Akbar thought it best to stay behind and ensure that everything made it to the next camp. I departed from the last soil I will set foot on for a month and said my goodbyes to the flowers and birds. From this point on, my movements will be on an icy glacial moraine and the landscape will be devoid of life. The morning was relatively cool and I arrived quickly to Goro I where I stopped to eat. In the end, most of my lunch ended up going to the yaks that I had been trekking behind who were searching the glacier for food to no avail. I continued on to Goro II and arrived at 11am. Some of the porters helped me set up our camp while we waited for Akbar to arrive and I spent the remainder of the afternoon charging equipment, drying my tent, and socializing with other climbers. 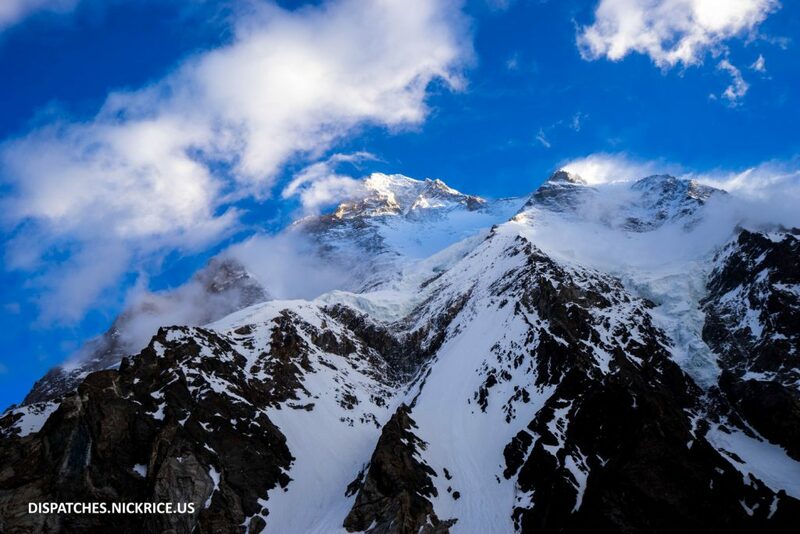 Rather than stay in Concordia tomorrow, we plan on trekking to Broad Peak base camp which is only 45 minutes away from K2 base camp. This will save the porters a day and will allow for them to descend farther to a warmer camp as they will be able to depart K2 base camp very early in the morning. Today is the Matam for Hazrat Ali, the father of Hazarat Husayn, so I will be joining Akbar and some of our porters after dinner for the Marsiya (مرثیہ‎‎) and Nohas (نوحہ‎). Today, I woke up at 4:30am, had a quick breakfast, and began the long trek to Urdukas. 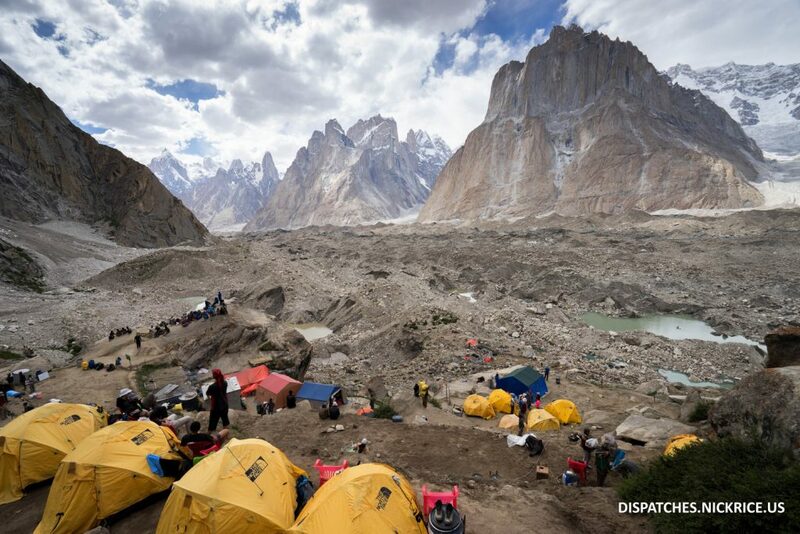 The route begins on the hillside, but quickly climbs onto the Baltoro glacier and traverses the mouth of the Indus river. 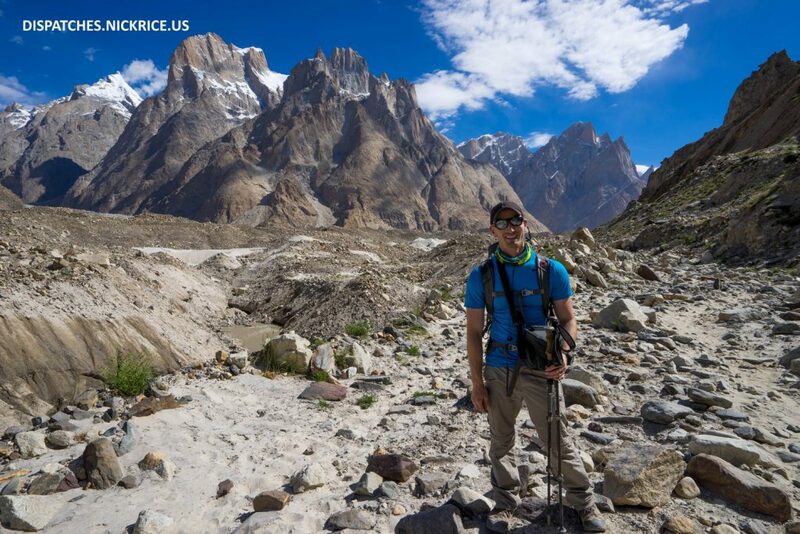 From there, we must traverse the 2 mile-wide Baltoro glacier, climbing up and down the moraine (the Baltoro Glacier is the largest glacier in the world and clearly visible from space). The weather was cool and we made good time, arriving to Korofong before most of the other climbers. We spent an hour there enjoying a long lunch and refilling our water, then continued onward to Urdukas. 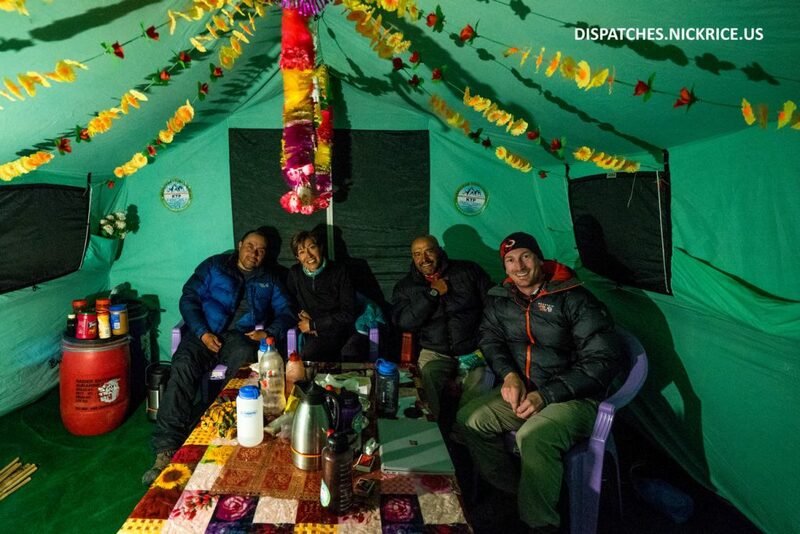 The porters whom had left in the night had successfully claimed a prime piece of real estate in Urdukas, and we settled in as others searched desperately for places to camp for the night. Although this day is always the longest and hottest day of the trek, it is also one of the most breathtaking. I always think of this as the entrance to one of Mother Nature’s most magnificent temples. Despite this being the seventh time I’ve trekked up this route, I am always almost moved to tears by the beauty that surrounds me. I always approach the mountains within her temple with the utmost respect and never let my ego get the best of me. In this landscape, we are tiny dots, completely inconsequential, and powerless to control the elements that could easily kill us. Glaciers could shift without warning, immense boulders hanging precariously above could crush us in an instant, and swift rivers could sweep us deep within the immense glacier. Here, we are at the mercy of Mother Nature’s will. Tomorrow I trek to Goro II where I will camp underneath Mashabrum. the Queen of the Mountains. 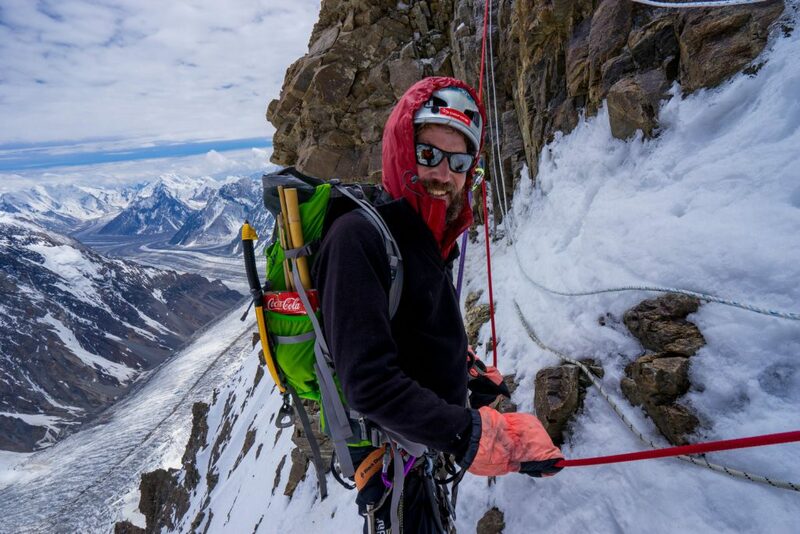 The following day, I will camp at Concordia where I will get my first glimpse of K2, or as it is referred to by locals, Chogori (which means King of the Mountains). Today, I woke up around 6:30am despite my intent to sleep in until 8:30am. 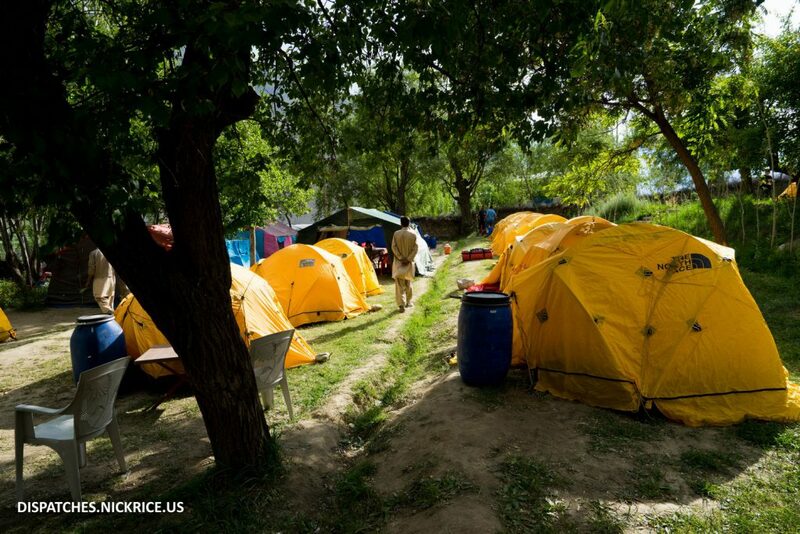 I headed down to the kitchen tent where Akbar informed me that all of the equipment from the horse that had fallen into the river had arrived after being recovered by Manzoor. After eating breakfast, I spent the morning playing cards with the Spanish K2 and Gasherbrum Expeditions. 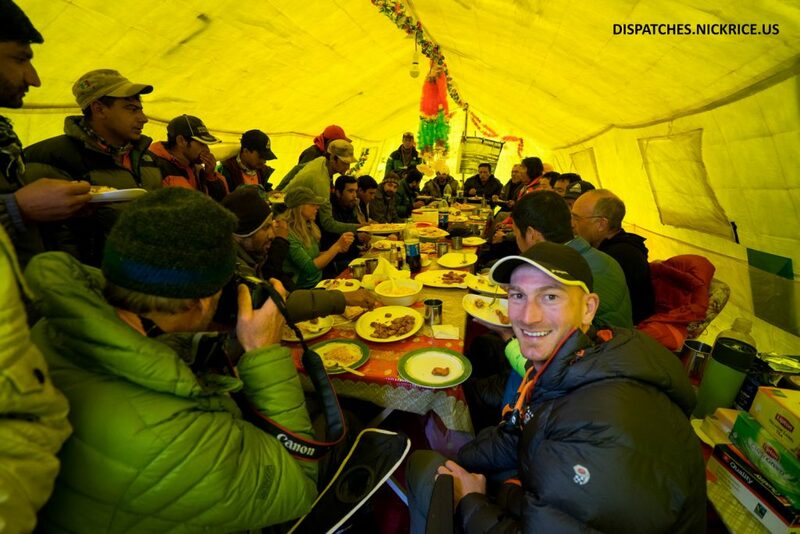 In the afternoon, Ryan Kushner’s expedition arrived to Paiju and we enjoyed lunch and dinner together. We also were paid a visit by most of the liaison officers present in Paiju. They just wanted to socialize. 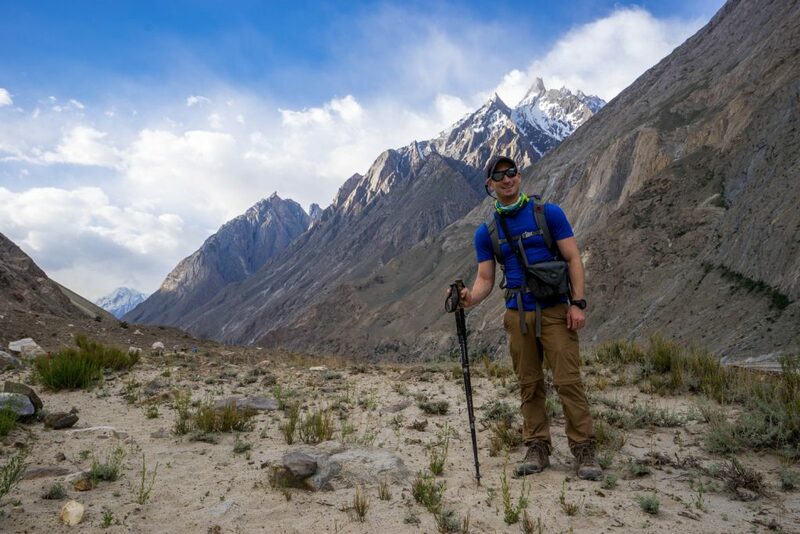 One of Ryan’s expedition members had drunk from one of the water spigots in Jhula (which are fed from streams up the mountain and are far from safe) without treating the water and suffered the consequences today. I’m not sure if he will be able to recover in time to complete the expedition. I plan on getting up at 4:30am, packing up, then eating breakfast at 5:00am and beginning the longest day of the trek to base camp in the cool hours of the morning. 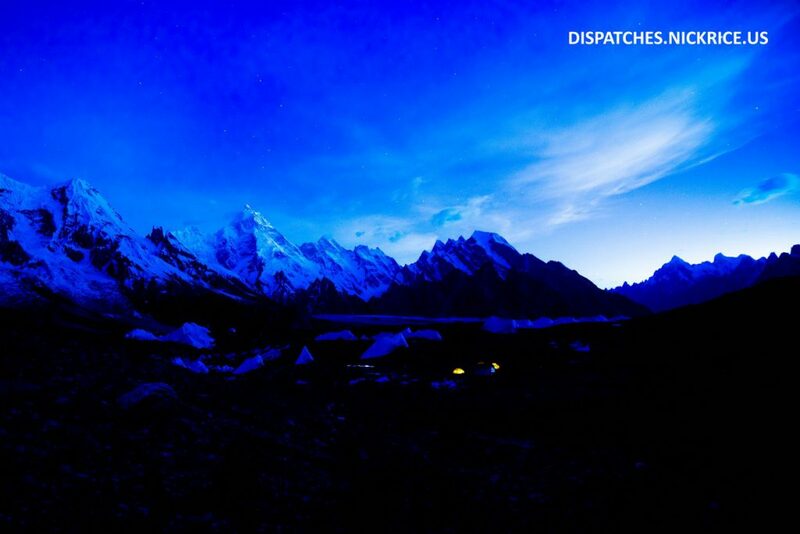 Akbar arranged to have a number of our porters depart at 1am so that they could claim a spot for us in Urdukas. 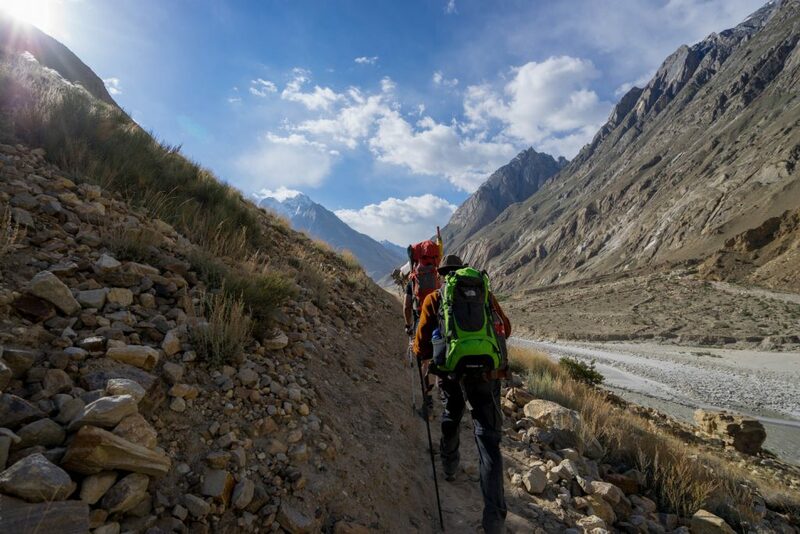 Because of the holiday before we departed Skardu, the military cleared all of the climbers from the previous three days at the same time, resulting in an abnormally large number of climbers on the same trekking schedule. It has been a struggle to find places in the camps to put the kitchen tent and personal tents, but Akbar has managed surprisingly well. Today, I woke up at 5am to a cloudy and cool morning, packed up my equipment and had breakfast in the kitchen tent with Akbar. The equipment that was apparently caught on the bridge and retrieved did not arrive, so I am using one of my high camp tents on the trek until it does. I trekked for 3 hours non-stop to reach Moncamp where I had my lunch then continued onto Paiju, arriving just after noon. I again nervously waited for my equipment to arrive, set up camp, took a shower (if you can call a cup and a bucket of ice cold water a shower), then had tea in the mess tent. I relaxed in the afternoon, had a quiet dinner with Akbar, then headed to bed. Tomorrow we will remain in Paiju for a rest day. 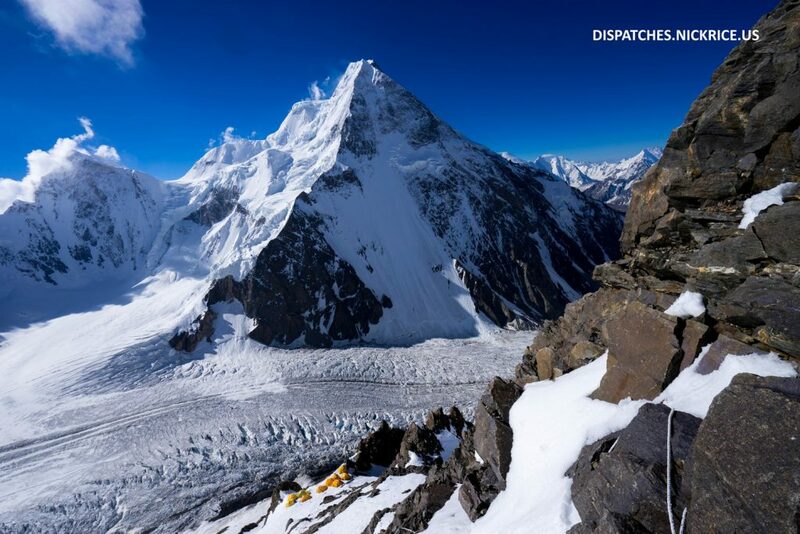 We expect Manzoor and Ryan Kushner’s Gasherbrum I and II Expedition to arrive in the afternoon tomorrow. Today, I woke up after a very good night’s sleep in Askole, packed up my gear, and ate breakfast. I waited for some time as porter loads were divided up, but was told by my liaison officer to begin the trek before the porters were ready to depart. I conceded as I didn’t want to start our relationship off on a bad foot, and began trekking toward Jhula at 6:10am. I made good time, arriving quickly to Korofong, where I stopped briefly to eat something. I finally arrived to Jhula at 11:00am (the distance from Askole to Jhula is 12.5 miles/20km) and waited with Badia, Mauricio, and Thomas for the equipment to arrive. I continued waiting for more than 5 hours until I was finally informed by our Sirdar that one of the horses had fallen through a broken plank on the first bridge crossing and had broken his leg. As they tried to free him, the wire suspension bridge tipped over and he was stuck hanging from his cargo which had caught on the wire of the bridge. They tried for some time to get the bridge to flip back to its correct orientation, but finally had to cut the horse free. Since the cargo was the only thing holding him, he fell into the water below and passed away as he was swept away in powerful whitewater. 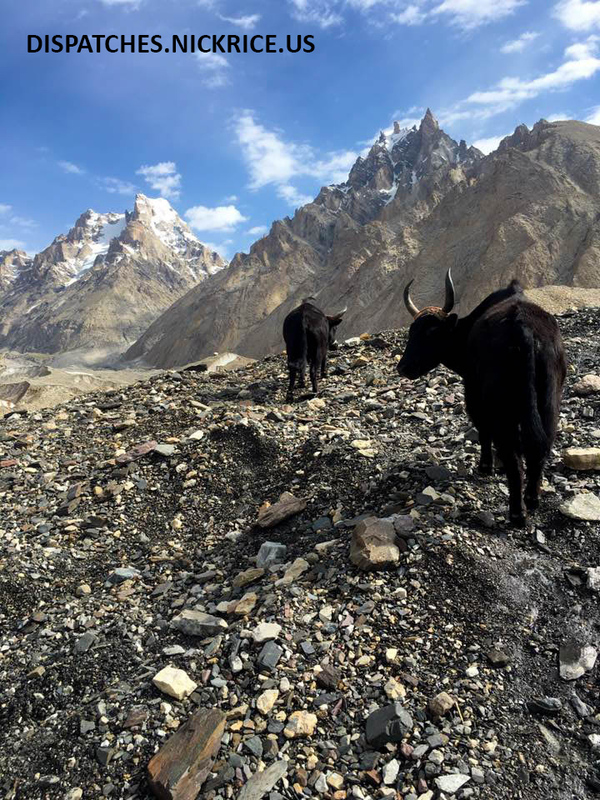 I have always resented the use of pack animals here in the Karakorum and elsewhere. 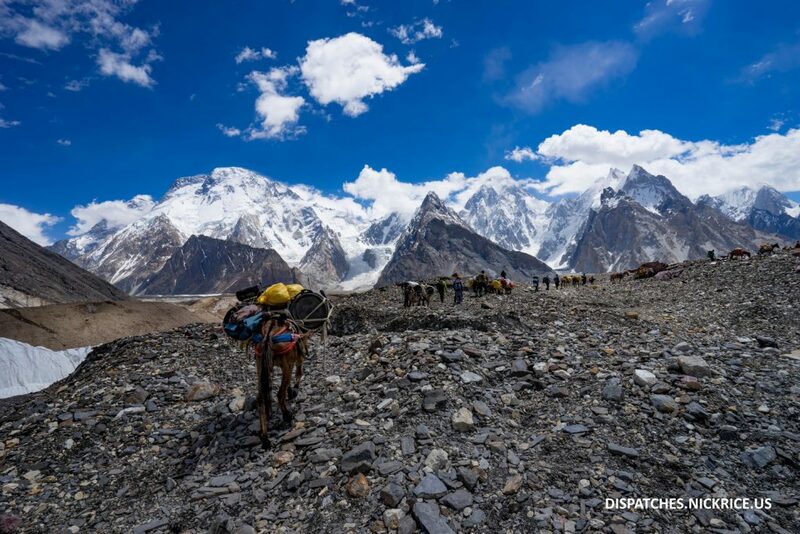 Although ferrying loads up the glacier is dangerous for both pack animals and men, the porters who carry loads choose to do so by their own choosing. The animals on the other hand don’t have a choice in the matter. When I first came to the Karakorum in 2005, only porters worked on the glacier. The predominance of donkeys and horses is a recent shift and one that I think was a mistake. I hope that incidents like this will drive home the point that this terrain is no place for a pack animal. Fortunately, due to my feelings about the use of pack animals, I had requested that my equipment be carried by porters if possible. Therefore, all of my personal equipment for the expedition arrived safely to Jhula in the late afternoon. Since the equipment that was loaded onto the horse was caught on the bridge, it will make its way up either on another horse of on the backs of porters in the coming days. But tonight, I mourn the loss of one of the members of my team. He will always be remembered and I will forever be grateful for his hard work. I ate my dinner with the Iranians then went to bed. Tomorrow, I will continue the trek to Paiju where we will rest for one day before continuing on to Urdukas.